Decking oil preserves, nourishes and protects garden decking from weathering, water, dirt, foot traffic and other surface contaminates. With so many oils available, it can be difficult to decide on which one is right for your garden decking. Choosing the right oil and the one that best meets your requirements can depend on the type of decking you have, the desired finish, budget, performance and maintenance expectation. Applying an oil to new deck boards is usually straight forward as there is no need to take into account any previous decking treatments or coatings. Whilst softwood decking can be oiled from new, new hardwood decking boards often need to be allowed to weather for a time before applying a decking treatment. Dense exotic hardwoods are naturally oily and have a tight grain. If an oil is applied too soon, it may not penetrate into the decking boards. Allowing hardwood decking to weather for a time to allow some of the natural wood oils to dissipate and for the grain to open is recommended. Always read the instructions from the decking supplier as the ‘weathering’ period can vary depending on the type of decking and species of wood used for the decking boards. Once the grain opens up the boards will more readily accept the oil. Some types of exotic hardwood timber such as Ipe, Yellow Balau, Massaranduba Cumaru, Iroko and of course Teak may require a highly refined or extra thin oil such as Osmo Decking Oil for the best results. Clear decking treatments are designed to nourish and protect garden decking whilst retaining the natural character of the timber. Clear products tend to darken the wood slightly, giving an almost damp like appearance, whilst enhancing the natural grain and character of the timber. To get an indication of how decking will look when oiled, simply wipe over a section of the untreated decking with a slightly damp sponge. Although many clear deck oils contain UV filters to help protect the deck from the greying effects of UV exposure, not all do. UV filters work much like suntan creams by filtering out and protecting the wood from harmful UV rays. Although they help to filter UV rays, they don’t stop them. This means that decked areas will naturally grey over time, albeit at a much slower rate than decking treated with a non UV resistant decking treatment. 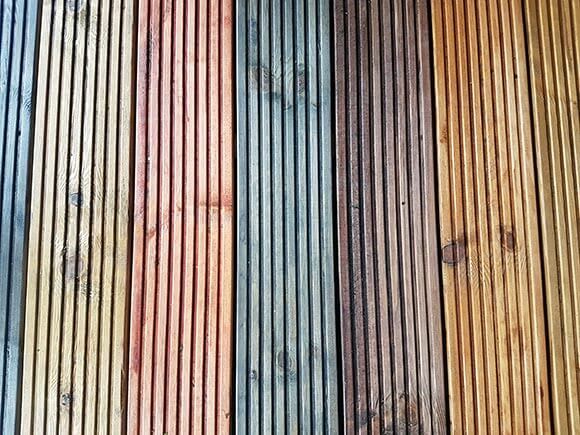 Using a coloured decking oil is a great way of changing the appearance and character of wooden decking. Available in a wide range of brands and colours, coloured oils are a great way to restore the appearance of old, tired and grey looking decking. Coloured decking treatments tend to offer a higher UV resistance to sun damage because of the colour pigments suspended in the oil. As a general rule, the darker the colour, the more UV resistance the oil provides. As an example, an Oak or Cedar coloured oil will provide better UV protection than a clear or natural oil. The following oil-based decking treatments are available in both clear and coloured formulations and are suitable for both softwood and hardwood decking. Ideal for decking steps and other outdoor wooden steps, slip-resistant or anti-slip decking oil products contain small particles within the oil that bond with the surface of the wood to create a microscopic textured layer. These oils are perfect for raised decks with steps and especially ideal for commercial premises such as pubs, restaurants and clubs where safety is a top priority. Anti slip oils work because they contain fine particles within the oil that when dry, form a slightly textured surface. Although too small to see, the dried oil provides improved friction and grip between feet, shoes and the surface of the deck. Although Anti-slip treatments tend to only be available in ‘clear’ formulations, they can be applied over a coloured deck oil once it has dried to provide a coloured finish with slip resistance properties. Deciding on which is the best decking oil largely depends on the individual project, the desired look and performance. Some factors are straight forward such as whether to buy a clear product to retain the natural colour of the deck or a colour tinted oil to add character or to achieve a specific look. Other factors to take in to consideration are do you require UV resistance, protection against mould and algae or a product that offers slip resistance, especially useful on decking steps or decked areas at commercial properties such as pubs and garden centers. Applying an oil to new, bare wood decking is quick and easy. Simply follow a few simple rules and your new garden decking will look amazing in no time. Most oil-based decking treatments only require two coats. Although there may be a temptation to apply three, four or more coats, this can actually cause a number of issues such as. 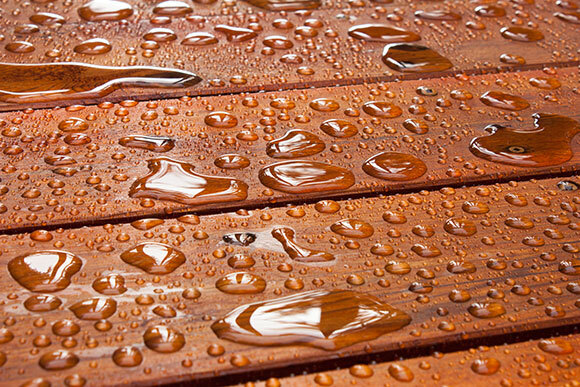 If wooden decking hasn’t been treated for a number of years and is exceptionally dry, it may absorb 3 coats of oil. After applying the recommended amount stipulated on the tin, wait a couple of days and try a thin third coat on a small test patch. If the third coat is absorbed by the deck and dries normally, it’s probably OK to apply a thin third coat. If the oil on the test area beads or sits on the surface, does not dry or remains sticky after 24 hours, it’s an indication that the timber has taken as much oil as it can and is not ready for more. Ideally, oil treatments should only be applied when air temperatures are 10 degrees centigrade or above. It’s also best to wait until it is forecast to stay mild and dry for at least 24 to 48 hours. Although most deck oils are touch dry in just a couple of hours, they usually need 24 to 48 hours to oxidise and harden before they provide full protection against foot traffic, dirt and water. Spring, Summer and early Autumn are the ideal times to treat decking. In addition to applying a fresh coat of oil in spring, it is also recommended to apply a maintenance coat or 2 before winter sets in. Oiling a decking in Autumn will help to protect decking boards through the cold, wet, winter months when snow, ice and freezing rain can damage the wood. When is a deck oil not suitable? Wood oils work by penetrating in to the surface of the decking boards where it oxidizes, dries and hardens. This cannot happen if the decking has been treated with a decking paint or varnish like decking stain. These types of decking treatments seal the surface of the timber with a film-like coating therefore preventing the oil from penetrating into the timber. Once oiled, decking should be routinely cleaned with a dedicated decking cleaner. These products are designed to clean the surface of the deck whilst preserving the decking finish. 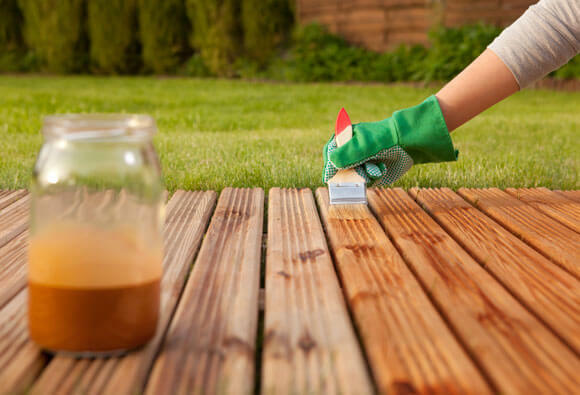 Household detergents and cleaners, including washing-up liquids should never be used on wooden decking as they are designed to break down and remove oil, stains and grease from surfaces. household cleaners will degrade and eventually strip the oil from the decking boards leaving the wood unprotected and exposed to water and dirt ingress. For decking where the oil-based finish has degraded to such an extent where it no longer repels or beads water, it is recommended that the decking boards are thoroughly cleaned with a decking cleaner or restorer and then re treated with a suitable decking oil treatment. For information on decking preservation, maintenance and cleaning, see our decking cleaners, restorers and decking preserver pages. In addition to decking, garden sheds, fences and garden furniture also require care and maintenance to keep them mould and algae free, looking good and protected from weathering. Find out more about garden shed treatments, garden fence treatments and garden furniture treatments, including preservers, cleaners, varnishes, paints and oils at home gardener.